Missing & delayed passengers are a huge problem area as airlines have very little visibility on the location of the passengers until they show up at the gate. Our Passenger Tracking/Blue Dot solution lets you know the precise location of the passenger within the airport to better understand deep path analytics* of passengers and optimize layout and staffing decisions. This solution allows the airlines to better serve their passengers and also make decisions on when to close individual flights and when to wait for passengers. The solution can also be used by airports to enrich traveler experience by providing app-enabled directional guides that help the traveler navigate through the airport. Our proximity marketing solutions can help airports generate non-aeronautical revenue by designing, delivering, and managing promotional content within highly targeted micro-location experiences. 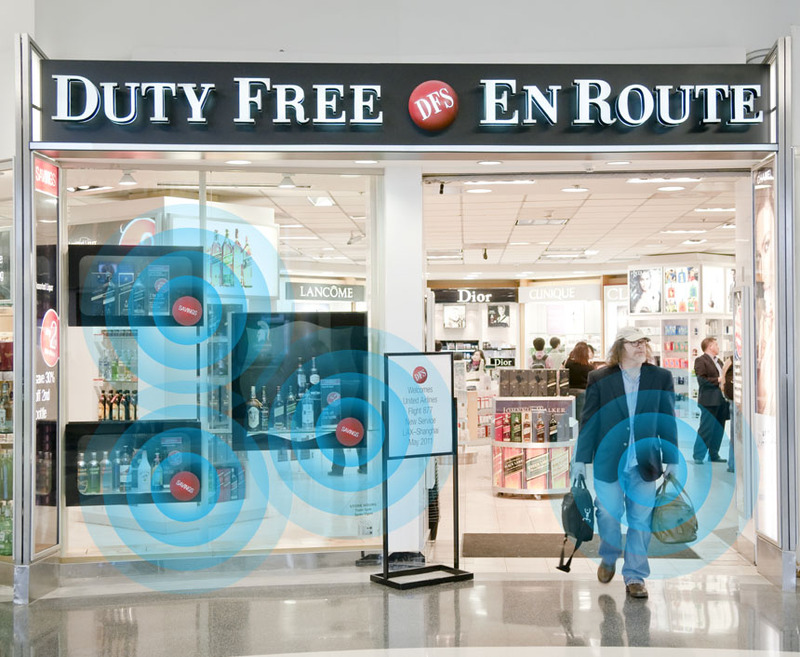 The proximity marketing solution can be offered to retailers within the airport who can target passengers based on proximity and purchase history, thereby narrowing the odds of increasing their sale. Our CMS allows the creation of hierarchical campaigns capable of hyper-local content delivery. Airports can use the solution to generate more analytics on consumer behavior through shopper habits like preferences, frequency of shopping and dwell times. Better understanding of these analytics also enables the airports to generate more ad revenue. Retail has been one of the early adopters of proximity marketing solutions. There are a number of vendors who offer hyperlocal marketing solutions, however, the true value of IoT for retail isn’t just in providing hyperlocal offers, but in helping retailers understand deep insights of their shoppers, including things like dwell times at endcaps and POPs, shopper path tracking, and people counting. Retailers have no means to directly attribute traffic or conversions to walk-ins and promotions. Our retail solution consists of two parts – a sophisticated CMS solution that allows retailers the ability to design, deliver and manage content in one place, and our analytics capabilities that provides visibility into key retail analytics. Our CMS solution lets you create, design and manage hierarchical campaigns so you can target multiple customer segments at the same time. Our cloud-based CMS was built for scalability allowing the remote management of beacons worldwide. Further, you can manage all your beacon content in one place, trigger mobile notifications, web views, external links, videos, offers, and custom templates based on the mobile devices’ proximity to beacons. Our proximity marketing solution supports Eddystone, iBeacon and sBeacon simultaneously so you can reach a larger audience at the same time. It also allows you to quickly setup and deploy thousands of beacons across multiple native applications, locations, and campaigns. In times when attribution and marketing ROI are grey areas for retailers, our traffic analytics solution provides a reliable measure for the performance of campaigns and promotions. With heat maps and dwell times to help you understand the effectiveness of end-cap and other promotions. The ability to attribute traffic to conversions with people counting and path analytics*. * The data is anonymous so you are not infringing upon your consumers’ privacy. Our analytics does not store PII. Dwell times: Understanding dwell-time of shoppers gives insight into engagement rates – window shoppers, conversions, time spent on displays, end-cap promotions, PoP, etc. and the overall effectiveness of the store’s merchandizing tactics. The historical data could be used for predictive analysis to plan campaigns, promotions and displays. The knowledge of real-time location can be used to optimize experience in the store and outside by providing directional assistance within the store and by sending relevant information and tips. Path Analytics: Understanding the hot zones and where shoppers spend the most time can help with reallocation of resources and planogram effectiveness. Insight and data into where your shoppers are in real-time, what their shopping patterns are and how long they spend with you can be an invaluable source for Clienteling. The above two features can also be used to understand real-time employee location and path history, along with the ability to match employee location and skill with shopper needs.